Quilts and quilting were always in my life. I remember being really little, about five I'd guess and watching my grandma and great-grandma hand quilt. Well, I should say I remember sitting under their quilting frames while they did their project with my own needle and thread so that I could work on my own project. For some unknown reason, they didn't want my help on theirs. I might have been five at the oldest. The first time I tried my hand at quilting was in the early 80s. My sister had my nephew and I helped my mother make him a quilt. I only gave it a trouper try back then. I wasn't too serious about it and the outcome was less than perfect. Then in 1994 my mother passed away. It was then that I realized that I needed to learn soon or all of my teachers would have been gone. My Aunt Glennie helped me out. She patiently showed me how to load quilts and make my stitches neat and even. I even started a small quilting group. It was me and five of my friends. We met every Sunday, quilted, and gabbed. It was great times. 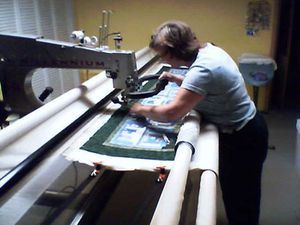 We moved out to the lake in Fall of 2004 and finally had the space for the perfect quilting machine. I went to an APQS demonstration in Indy. There it was, the perfect machine. It is an APQS Millennium, Millie for short. I was in love. It has everything; automatic stitch regulator, aircraft grade aluminum, 26” throat size, and a power foot petal for loading and unloading. Best of all, it made perfect stitches. I wanted it, needed it, and yes, I ordered one that day, and she came the weekend of Paducah quilt show in the spring of 2005. I started out keeping my full time job and quilting for close friends and family. Finally I got so busy I had to give up the day job. I've been loving my quilting job, and quilting ever since. It's been great to have a business doing something I enjoy! I hope it continues on forever!! !